What an amazing vote. The people of the United Kingdom defied the supposed experts, rejected a fear-based campaign by advocates of the status quo, and declared their independence from the European Union. Here are some takeaway thoughts on this startling development. 1. 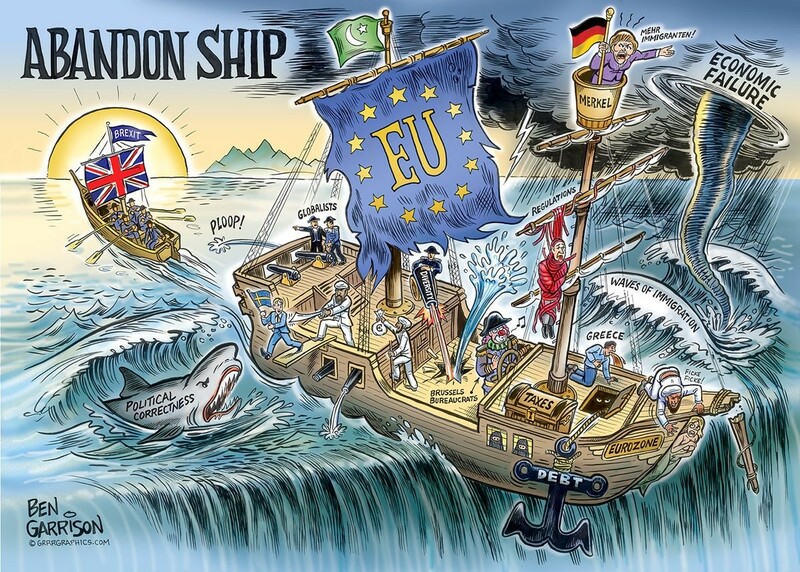 The UK has voted to leave a sinking ship. Because of unfavorable demographics and a dirigiste economic model, the European Union has a very grim future. 2. Brexit is a vote against centralization, bureaucratization, and harmonization. It also is a victory for more growth, though the amount of additional long-run growth will depend on whether the UK government seizes the opportunity for lower taxes, less red tape, and a smaller burden of government. 3. President Obama once again fired blanks. Whether it was his failed attempt early in his presidency to get the Olympic Games in Chicago or his feckless attempt in his final year to get Britons to remain in the EU, Obama has a remarkably dismal track record. Maybe I can get him to endorse the Boston Red Sox, thus ensuring the Yankees make it to the World Series? 4. Speaking of feckless foreign leaders, but I can’t resist the temptation to point out that the Canadian Prime Minister’s reaction to Brexit wins a prize for vapidity. It would be amusing to see Trudeau somehow justify this absurd statement, though I suspect he’ll be too busy expanding government and squandering twenty-five years of bipartisan progress in Canada. Potential mea culpa…I can’t find proof that Trudeau actually made this statement. Even with the excuse that I wrote this column at 3:00 AM, I should have known better than to believe something I saw on Twitter (though I still think he’s vapid). 5. Nigel Farage and UKIP have voted themselves out of a job. A common joke in Washington is that government bureaucracies never solve problems for which they were created because that would eliminate their excuse for existing. After all, what would “poverty pimps” do if there weren’t poor people trapped in government dependency? Well, Brexit almost surely means doom for Farage and UKIP, yet they put country above personal interest. Congratulations to them, though I’ll miss Farage’s acerbic speeches. 6. The IMF and OECD disgracefully took part in “Project Fear” by concocting hysterical predictions of economic damage if the U.K. decided to get off the sinking ship of the European Union. To the extent there is some short-term economic instability over the next few days or weeks, those reckless international bureaucracies deserve much of the blame. 7. As part of his failed effort to influence the referendum, President Obama rejected the notion of quickly inking a free-trade agreement with the UK. Now that Brexit has been approved, hopefully the President will have the maturity and judgement to change his mind. 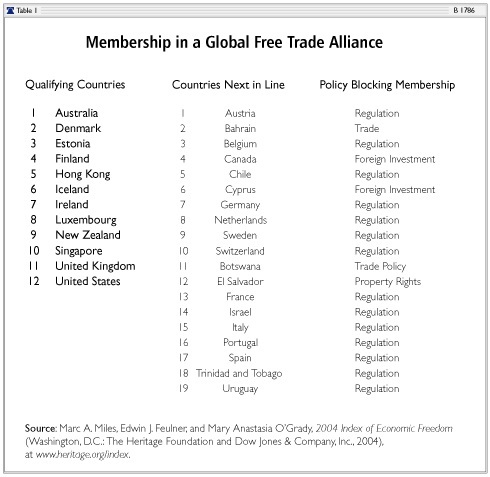 Not only should the UK be first in line, but this should be the opportunity to launch the Global Free Trade Association that my former Heritage Foundation colleagues promoted last decade. Unfettered trade among jurisdictions with relatively high levels of economic freedom, such as the US, UK, Australia, Switzerland, New Zealand, Chile, etc, would be a great way of quickly capturing some of the benefits made possible by Brexit. 8. David Cameron should copy California Governor Jerry Brown. Not for anything recent, but for what he did in 1978 when voters approved an anti-tax referendum known as Proposition 13. Brown naturally opposed the referendum, but he completely reversed himself after the referendum was approved. By embracing the initiative, even if only belatedly, he helped his state and himself. That would be the smart approach for Cameron, though there’s a distinct danger that he could do great harm to himself, his party, and his country by trying to negotiate a deal to somehow keep the UK in the EU. 9. Last but not least, I’m very happy to be wrong about the outcome. I originally expected that “Project Fear” would be successful and that Britons would choose the devil they know over the one they don’t know. Well, I’m delighted that Elizabeth Hurley and I helped convince Britons to vote the right way. We obviously make a good team. Joking aside, the real credit belongs to all UK freedom fighters, even the disaffected Labour Party voters who voted the right way for wrong reasons. I’m particularly proud of the good work of my friends Allister Heath of the Telegraph, Eamonn Butler of the Adam Smith Institute, Dan Hannan of the European Parliament, and Matthew Elliott of Vote Leave. I imagine Margaret Thatcher is smiling down on them today. Now it’s on to the second stage of this campaign and convincing California to declare independence from the United States! Please copy/paste on internet randomly, for days as this will be censored. Basically, police, firemen, security rabble (and cronies) appear to be attacking/stalking citizens COVERTLY (network)…in many cases for having reported crime, looking different, or “just because”. The electronic surveillance works in tandem with breaking into homes. Do the math. They stalk to watch , and report home vulnerability, so they can break in, plant devices, or steal. You will find network operatives at local hospital, FIVE POINTS BURGER JOINT ,YMCA, etc., and even outside Seven Eleven, using bluetooth communications.They are petty criminals, authorized to serve, but instead, as Kennedy warned…they are part of a secret network… many use the masonic symbol..low level idiots, and attend lodges. “SNEAK AND PEEK” (authorizing police to come into your home while you are not there). That’s what surveillance is for. The stalking is to watch and see when homes are “isolated, so they can plant bugs (entrapment), or steal (GPS tracking devices planted on your car). An unlimited black budget of your tax dollars at work. By organized criminals. P.S. What are Elks, Lions, and the rest of fraternal centers, but..Satanic lodges. Basically, police, firemen, security rabble (and cronies) are attacking/stalking citizens COVERTLY (network)…in many cases for having reported crime, looking different, or”just because”. The electronic surveillance works in tandem with breaking into homes. Do the math.They stalk to watch , and report home vulnerability, so they can break in, plant devices, or steal. You will find network operatives at local hospital, YMCA, etc., and even outside Seven Eleven, using bluetooth communications.They are petty criminals, authorized to serve, but instead, as Kennedy warned…they are part of a secret network… many use the masonic symbol..low level idiots. P.S. what is Elks, Lions, and the rest of fraternal centers, but..Satanic lodges. I suggest that Farage and UKIP will become even more important. There are large proportions of the elites in both the “Conservative” and Labour parties who are vehemently Remain-ders. Large numbers of Tory MPs will not want to follow Boris Johnson. The referendum campaign showed those splits. Many may jump ship to join UKIP. And already there is talk of an election in October from the Remain-ders hoping for a different result, methinks. And of course, Merkel says ‘No conversations before Article 50 is invoked.’ So Cameron surely will not do that. The only freedom that matters in an individual state constitution is the right to bear arms. All else flows from that single right. The only freedom that matters in a federal constitution is the right to secede. All else flows from that single right. So the Brits rose up in rebellion against having to pay taxes to a government over which they had virtually no control. Well that’s fine now. Where were these people in 1776, huh? You suppose British wallets have escaped the Greek voter? And the Spanish voter? And the Portuguese voter? And the French voter? Decline brings discord — and that is ultimately a good thing. The world woke up to a somewhat freer future this morning. More choices, more parallelism more avenues towards human progress, a little further away from the innate harmonizing and homogenizing totalitarian tendencies of humans. It was Britain’s turn to fire a shot to be heard around the world. It’s been a very long time since I felt freedom had scored a political victory. As I had said before, decline brings discord. And that is a good thing. It is part of the self correcting mechanism that sometimes pulls societies back from decline. And indeed, decline is the core characteristic of Europe. A continent whose share of world GDP has halved in a mere four decades — a really steep decline. Seems like no other continent has ever experienced such rapid decline in peacetime. Britons should stop looking at the businesses and employment that currently exist (many just products of central government cronyism) and look to the future, freer and more truly globally competitive businesses that will naturally emerge in a freer Britain. These companies will be more truly competitive — and thus much more resilient globally. Of course it is no panacea. Freedom is the first step. While the long term prosperity odds of a freer Britain are higher today than yesterday — a lot still depends on how that freedom is used. Exit the EU with a Swiss or Thatcherite mentality and you will prosper. Exit with a Greek mentality and you become Venezuela. The British people do not strike me as that naive, but I would not bet my personal freedom and prosperity on it. The danger with the U.K. Is that it may have already slipped too far down the welfare state road to pull itself up. Sure, in a more free and less centralized Europe competition will ultimately propel freedom — but that may be a long tortuous process with many regressions. While Britons voted for independence and exit, I’m not sure many of them voted so for the right reason. We also have to see how deviantly and vindictively all the international bureaucracies and their staffs act towards the UK. A large portion will seek underhanded ways to make an example of those nations who sabotage submission to international harmonization and homogenization under an international bureaucracy. I’m anxiously awaiting the first country that will exit the OECD — though I should probably not say that too loud publicly. It will be interesting to see how the rest of the EU reacts. Will they quickly close the door to secession (like the United States has) or will they fear that it will make people even more resentful of power centralization. How many Eurocrats and their voter-lemmings will cry “Anschluss von Brittanien”. …here in still luckier America (for now), keep your head up to the light of individual freedom, and do the best you can with the more suicidal elements of humanity. Having a country that respects and enforces the rule of law is in my personal interest. What good is an inflated salary if you have to rent-a-cop with it? How bout if the rest of us split from California? To point #4, Trudeau may not have said it, but the New York Times has a video posted on Facebook of a woman interviewing millennial types in a Tunbridge Wells pub, and one of the women said pretty much exactly that. She was afraid that leaving the E.U. would cause women in the U.K. to lose their equal rights. That, and they didn’t want to start having to buy private health insurance when they went on vacation to the continent (which actually is something you have to deal with when you have taxpayer-provided healthcare. Your benefits end at the border in the absence of a reciprocal agreement). California? In the wake of a Clinton presidency, I am going to be busy fomenting #texodus. convincing California to declare independence from the United States! Heck….we, up in the ‘real’ Northern California have been trying to declare independence from the State of California since the 1940’s. STATE OF JEFFERSON. We STILL are trying to get away from the non representative Sacramento government that oppresses us. They don’t want us to be free, of course, they want our resources. Water, minerals, lumber, agriculture and of course taxes. The real question is whether anyone would miss California if they left. Been humming it all morning. “Britons shall never, never be slaves”! 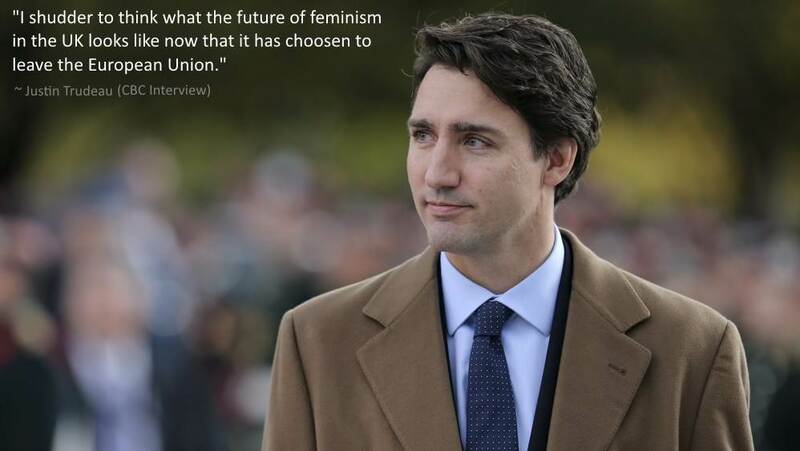 Bad for feminism said the Canadian PM? Wonder how the town of Rotherham voted on this? idiot! Phil, Puerto Rico has been free to go for some time but despite all the suggestions from others they stubbornly cling on..
1. I have great confidence in the stupidity of the elites. They will hand governance of the U.K. over to Nigel Farage and UKIP because they haven’t the wit to understand why they lost. 2. No one will ever go broke betting against President Obama’s maturity, judgement, or ability to change his mind in response to reality. I have hope for the future! For the first time in years. “Keep calm and head for the exits”.